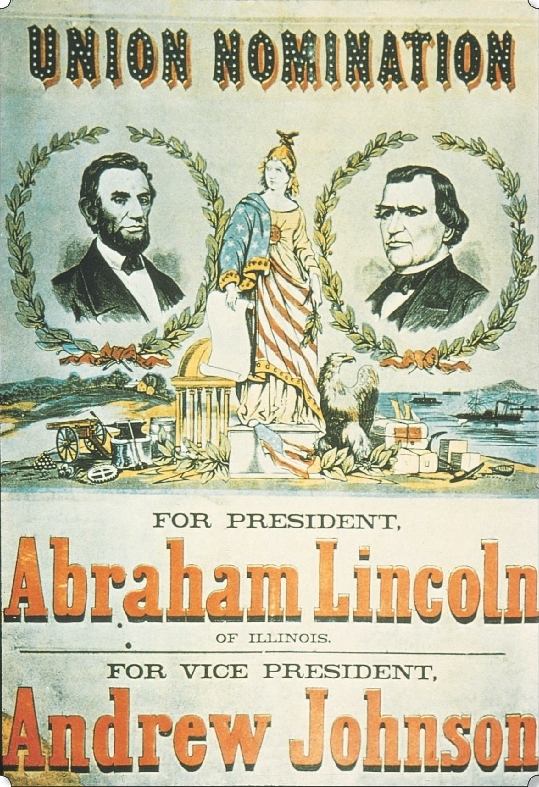 In his second presedential campaign, Abraham Lincoln ran on a Union (rather than Republican) ticket with Democrat Andrew Johnson to position himself as the protector of the Union rather than the leader of a single faction. Posters like this (approximately 14×20 inches) would have been displayed in shop windows and other public places. Just got back from seeing the movie Lincoln and am all pumped up on the topic. Came across your photo of the 1864 campaign poster on the internet. I have the same poster but without any color. Purchased it at a farm auction in upstate NY. The dimensions match the size you say was typical for the poster but I can’t find any photos of the broadside without color. Can you give me any insight as to whether they printed this poster without color. Your help would be appreciated. I do not know anything about the poster. It is in the Smithsonain collection and I would ask them.